One Of A Kind Baby Girl Tutu Birthday Dresses. Beautiful Baby Girl Cupcake 1st Birthday Tutu Outfit. Personalized Available in all colors and For All Ages. Custom made for each Princess. Can be customized to your 1st Birthday theme colors! Great Birthday Gift! Perfect for photo props! Available for all ages please message me for details. This listing is for a tutu,shirt and bow. 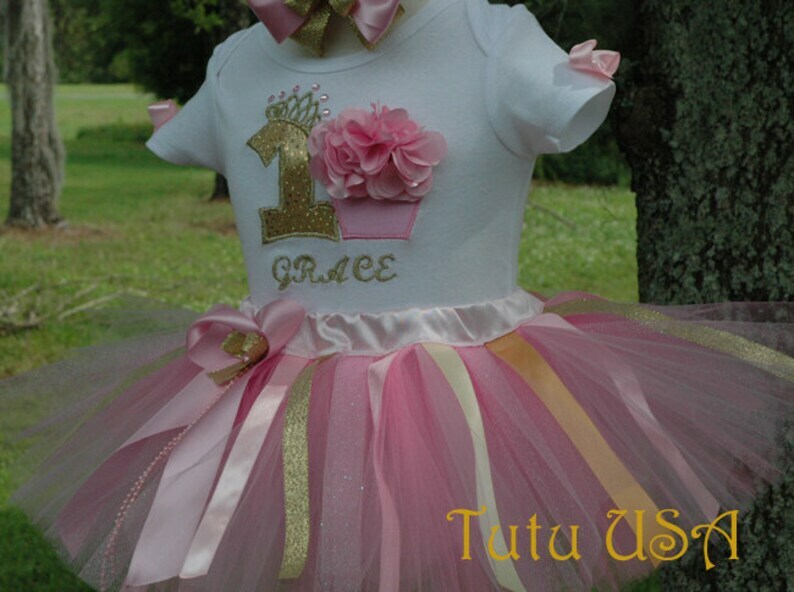 This beautiful gold and pink tutu set has been handcrafted for perfection and your Princess will look beautiful!! Shirt will be personalized with your baby's name. It features a number one in gold and a cupcake bottom in beautiful pink fabric. Both appliques are sewn to the shirt with beautiful matching thread colors. The top of the cupcake features soft pink flowers that are sewn to the shirt. The shirt also features soft pink bows on the sleeves. The bows will have soft pink rhinestones in the middle. Both bows are sewn to the shirt. Shirt available in long or short sleeve you may choose at checkout. The beautiful boutique hair bow is made with 2 bows. One pink bow and a gold bow on the back of it. Features a small gold bow and a beautiful pink rhinestone on it. The bow has been hand sewn and does not contain any wires!! Finally the bows are sewn together and placed on a beautiful elastic white headband.